AIRY APO104T apochromatic refractor with field flattener, 104mm diameter, 650mm focal length (f6.25), FPL-53 apochromatic 5-elements design (front triplet with 2 ED lenses + rear 2 elements field flattener) with aluminum tube, 2,7" Hybrid-Drive focuser with fine focus knob, 2" GIOTTO filter drawer, manual field rotator, PLUS support rings, transport hard case. AIRY APO104T with field flattener is the perfect telescope for long exposure astrophotography: thanks to perfect color correction, great contrast and large flat field with dedicated field flattener (flat field diameter: 44mm), it creates spectacular images even with big size sensors (like FullFrame ones). Thanks to particular front lens with 2 ED lenses (instead of 1 as usual), AIRY APO104T provides the highest quality images for all applications: unlike other telescopes with integrated field flattener, you can remove the field flattener and use the telescope without restriction for visual application or for planets and Moon imaging. Telescope collimation and optics test included in the price! AIRY APO104T apochromatic refractor with field flattener, 104mm diameter, 650mm focal length (f6.25), FPL-53 apochromatic 5-elements design (front triplet with 2 ED lenses + rear 2 elements field flattener) with aluminum tube, 2,7" Hybrid-Drive focuser with fine focus knob, 2" filter drawer, PLUS support rings, transport hard case. 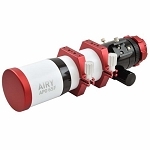 AIRY APO104T uses a 5-elements optical design (front triplet with 2 ED lenses + rear 2 elements field flattener) just designed for astrophotography, offering large 44mm diameter flat field and perfect chromatic aberration! For this reason AIRY APO104T with field flattener is perfect also for the most difficoult astrophotography where very long exposure times are required, even with large sensor size camera! More, instead of the usual triplets that use one ED lens and two Crown glass lenses, our AIRY APO104T with field flattener uses 2 ED lenses (one FPL-53 and one FPL-51), an innovative solution that allows you to get an even better chromatic aberration correction! 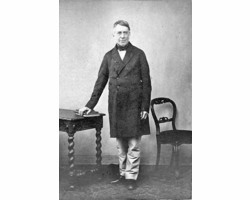 The result is a perfect image, without any aberration with the colors that reach perfectly the same point of focus. 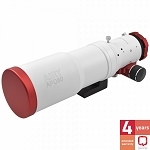 One of the strengths of the AIRY APO104T refractor is its wonderful Hybrid-Drive 2,7" focuser. The mechanical building precision eliminates the problem typical of normal Crayford focusers that, during the long exposures required by astrophotography, can have camera slippage moving the sensor out of focus. 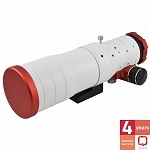 For this reason we have chosen to provide our AIRY APO104T telescopes with the Hybrid-Drive 2,7" focuser that adds, under the focuser tube, a rack and pinion thereby maintaining in position even heavy cameras (load capacity of up 8 Kg). Below the focuser there's also a locking screw: closing it, you will be sure that your camera will not move any more! The field flattener is directly threaded on the focuser's tube to avoid flexions and the focuser also features a convenient 1:11 fine focus gear, particularly useful when you need to focus at high magnification. On the back of the focuser there is an M48 thread (48x0,75) to connect photographic equipment (requested backfocus: 55mm). You can convert M48 thread to T2 with the included T2 (M42x0,75) adapter. This way you can connect any photographic instrument (like a camera) that comes with T2 ring, keeping the same 55mm backfocus distance. The focuser has a very long travel (95mm) to allow the use of both photographic (cameras with accessories) and visual (eyepieces and mirror diagonal) instruments. For visual use, we recommend our 50.8mm XP dielectric mirror diagonal. Immediately in front of the flattener there is the GIOTTO 50,8mm filter slider. The filter slider has a drawer where you can insert any 50.8 mm diameter filter (equipped with m48x0,75 thread and with cell thickness up to 7mm). With the GIOTTO filter slider you can easily change the filter with a convenient snap mechanism without removing your camera! A conveniente rotator field, that oomplete the included photographic accessories, allows you to rotate the entire rear part of the focuser: this way you can adjust the imaging object framing, keeping the focus point. 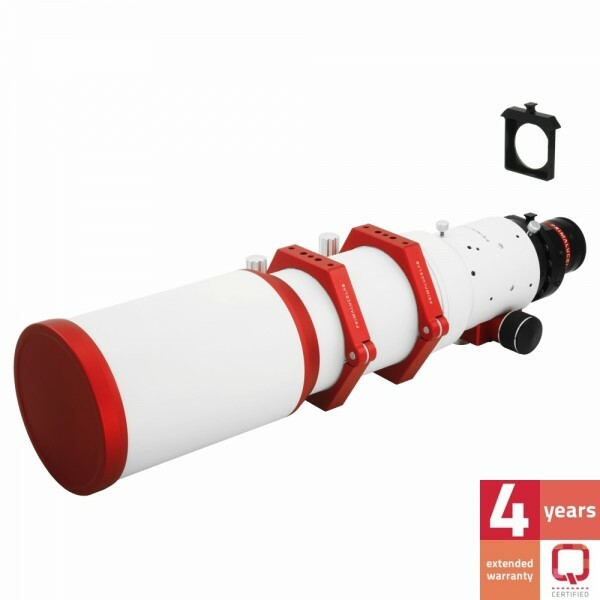 Unlike other telescopes with integrated field flattener, you can remove the AIRY APO104T field flattener and use the telescope without restriction for visual application or for planets and Moon imaging. You simply have to thread (instead of the field flattener) the optional OnAxisLock 50,8mm eyepiece holder for 2,7" Hybrid-Drive focusers and you will have the 50,8mm connection in order to use various accessories like eyepieces, mirror diagonals or Barlow lenses. The OnAxisLock locking device allows you to perfectly lock the inserted accessory by rotating the outer (red) ring (instead of normal thumbscrews as in other telescopes): a special inner ring tightens accessories with a uniform pressure. The OnAxisLock device also helps keep perfectly aligned on axis the accessories inserted into the focuser: you'll be so sure that the connected accessory will be perfectly centered in the telescope optical axis. 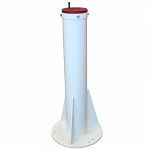 You will be amazed of the mechanical quality of our AIRY APO104T with field flattener: full aluminum intubation made with precision CNC machine is rugged yet lightweight. All the components are treated at the highest levels to provide an instrument with which is a real pleasure to photograph or watch the sky! The aluminum front dew shield can be closed to make the telescope more transportable. The front cap is completely aluminum made. The focuser can be rotated freely through 360 degrees (without changing the focus point) to position the camera with the right angle and perfectly frame the object you want to record. The AIRY APO104T refractor with field flattener is an optics and mechanics jewel, and to carry it or keep it protected at best, it comes with a beautiful aluminum hard case. Forget about the uncomfortable and weak support rings that are often found in cheap telescopes! Our AIRY APO104T apochromatic refractor has beautiful aluminum anodized support rings, made with high precision CNC machines, which are part of the PLUS (Prima Luce Universal System) system. This gives you maximum freedom in adapting the telescope to your request; at the same time, it has all the threaded holes, holes and slots suitable for connecting all the PLUS compatible elements, always with simple M6 screws. In fact we have developed Q-certified, a comprehensive control system that we work out in our laboratory prior to shipment and delivery of the product you ordered. In fact, before delivering the AIRY APO104T telescope, we test the collimation and the perfect functioning of all mechanical components. In addition, we pay much attention and care to shipping, carrying a sturdy packaging and giving it to the courier service. We want to be sure that you will receive your new AIRY APO104T not only in the shortest possible time but also with utmost care. 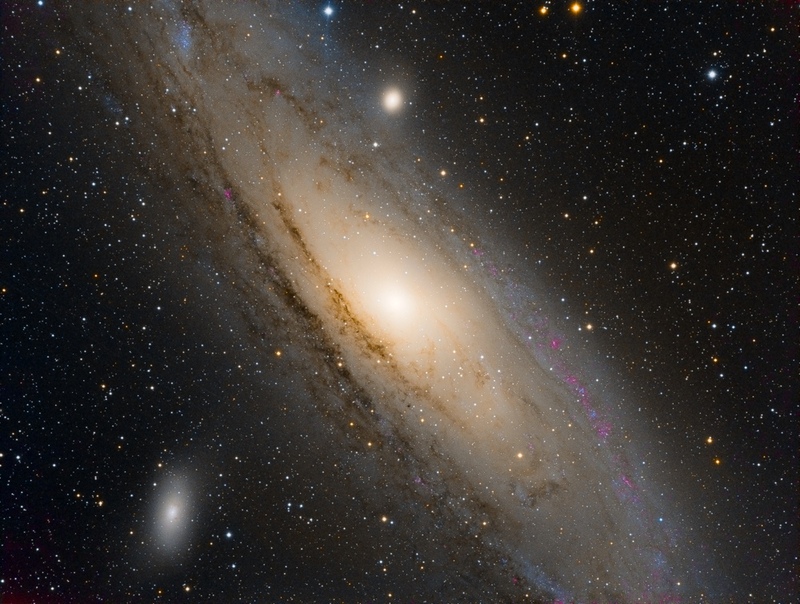 M31 galaxy recorded by Domenico De Luca with AIRY APO104T with field flattener and SBIG ST-8300M camera. 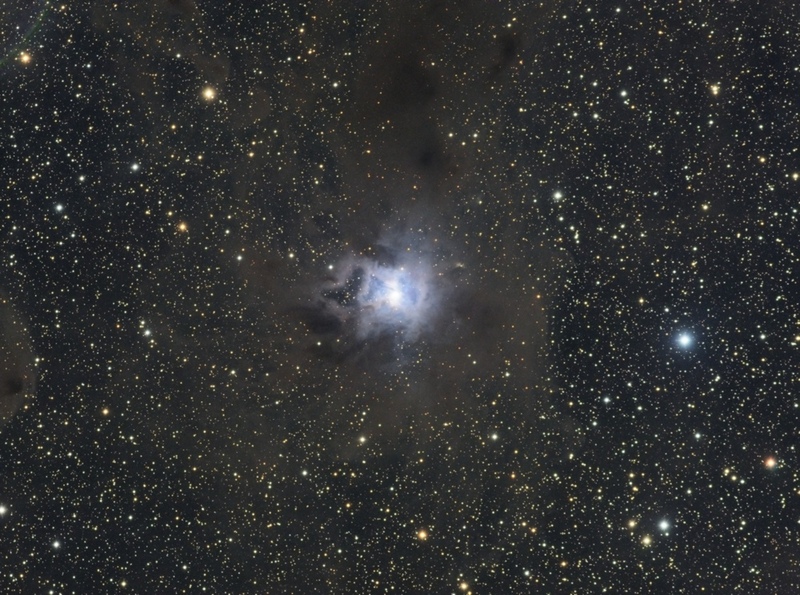 NGC7023 nebula recorded by Fabio Semeraro with AIRY APO104T with field flattener and QHY9M camera. Just received my 104T and accessories. As an international purchaser from Romania, I did not feel any hindrance due to communication, as the whole staff speaks perfect English. No unreturned calls or emails, no frustration or haste sensed on the seller's side. I bombarded them with 100 pre-purchase questions, and Filippo personally has responded all of them in due time (usually the same day). He was also available on Skype, which was a nice treat. I got to discuss all pre-purchase questions and concerns directly with the owners/CEO, which is not your everyday shop experience for state-of-the-art instruments when bought with online distributors and not the actual brand shop. The intra focal and extra focal collimation test pictures were sent in advance. Just perfect. In one word, the level of personal, customised service you get when you set your sight on one of their products matches the quality of the product. Now to the OTA. It is truly The Ferrari of telescopes. When seeing, touching and working the mechanics of the 104T, you get the same feeling as driving the famous Italian supercar. Nothing compares to it. The materials and the engineering design of this piece of art leaves absolutely nothing to desire, and go beyond of what myself could have imagined, should I ever wanted to design a telescope and rings systems. Only very talented, dedicated, experienced, competent and passionate people can put so much care and attention to detail as in this product and the PLUS system. I guess they got sick waiting for somebody else to do something like this, so they decided to design and produce it by themselves. You should be assured my enthusiasm is genuine, whereas any exaggerations, although I made none, would still make justice for this product. The simplest description of the 104T is this: imagine a telescope just as you'd want it, increase that expectation by 100% (if you can, or if you can't, then try to theorize) and then be sure that's what you'll get in the box at your door. And I mean design, mechanics, feel, colour, optics, fitness of various parts and accessories etc. You name it. I'm a very critical and analytical individual, taking my time before each purchase, and a perfectionist. This was one of those very rare occasions when I simply can't complain about anything, both on the shopping experience as well as on the products themselves. If you plan to buy your ultimate portable telescope with these specifications (f rate etc. ), then the 104T would be the right choice. Unless the technology will change to make the current known best telescope designs, optics and builds obsolete, you won't feel any desire or need to look for something different. I'm sure I won't, as I'm sure this telescope will bring countless wondrous skies in my life and to my family for many years to come.